Analia Centurion is an internationally renowned Tango dancer and instructor. From the tender age of 6, her formation included piano and classical ballet. She began to dance Argentine Tango in 1995. Two years later she became stage tango champion in the most prestigious youth competitions in the province of Buenos Aires. Her trajectory includes dancing with the companies of Juan Carlos Copes, Mora Godoy and the great Mariano Mores, as well as some of the most famous Tango Dinner/Shows of Buenos Aires: Piazzolla Tango, Madero Tango, La Ventana Tango and many more. In the halls of Buenos Aires, she learned with great milongueros such as Mingo Pugliese, Puppy Castello and Gerardo Portalea. Performing in the most famous milongas: La Baldosa, El Parakultural, Sunderland Club, etc. She also studied and graduated from the academy “Estilos de Tango Argentino”. Most recently she has represented her Argentine Culture in the Vail International Dance Festival, along great stars of the American Ballet Theatre and Martha Graham Dance Company amongst others. Her artistry gained her recognition in magazines like The New Yorker and made headlines nine times in the the New York Times. She was Jury at the Tango World Championship in Buenos Aires and Metropolitan of tango in Buenos Aires. Recently, most of her engagements have gravitated towards the United States, teaching seminars, workshops and performing in New York NY, San Francisco CA, Washington D.C., Maryland, Virginia, Salinas CA, Albuquerque NM, Miami FL, El Paso TX, Los Angeles CA, San Diego CA, Honolulu and Kailua HI. Argentine native Jeremias Fors was trained musically by his father since he was seven years old and attended the music programs of New World School of the Arts and Florida International University on full scholarships as a Music Performance Mayor. This training and discipline then carried over into the tango: As a dancer, teacher and choreographer. In 2010 he co-founded the company Tango Axis LLC. and created the shows “Eras del Tango” (2010) and “Amor Porteño” a.k.a Tango Suites (2016). Jeremias has also performed and choreographed with the following shows and groups: Maria de Buenos Aires (Atlanta Opera 2017, New Orleans Opera 2017, Nashville Opera 2017, Florida Grand Opera 2013), Luis Bravo’s Forever Tango (2016), the U.S. tours of This Is Tango Now-Identidad (2013, 2012), Masters of Tango by Tango Fantasy (2011), La Magia del Tango (2016, 2015), A Puro Tango II (2014), Amor de Tango (2011), Tango Lovers (2009), Lancaster Symphony, South Florida Chamber Orquesta, Sexteto Milonguero, Anibal Berraute Quartet, Quintango, Guillermo Petri’s Grand Orquesta, Alvaro Hagopian Trio, Artango Dance Company, Tango Fantasy and Dance South Florida Entertainment, among many others. As a teacher, Jeremias has developed a highly technical teaching style that embarks the full vocabulary of the tango dance today. He is fluent in both English and Spanish and has taught and performed in the following festivals: Yunta Brava Florida (2016), Florida Tango Encounter (2016 & 2017), 15th Miami Tango Fantasy Festival (2011), 9th Annual Boston Tango Festival (2012) and Boulder Tango Festival (2014 & 2016). The always fun and amazing Tango Master Analía Centurión and Jeremias Fors return to Caminito Amigo. 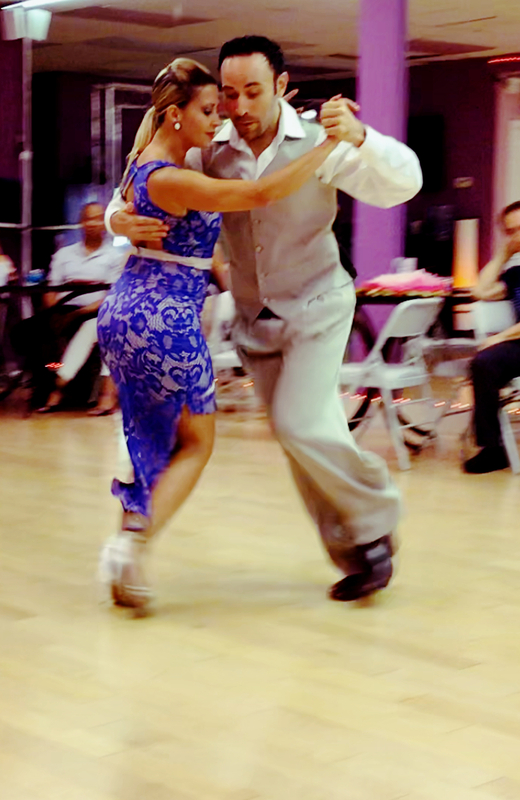 Join us for Analia and Jeremias' first class during their visit to DC. The final workshop with Analia. Workshop 3 of 4 with Analia Centurion. Milonga just like in Chacabuco, Argentina. Workshop 2 of 4 with the Amazing Analia Centurion! Analia's Milonga is $5 with Registration to any Weekend Workshop. Workshop 1 of 4. Multiple Workshop Discounts at Registration. The incredible master Analia Centurion visits the DC area direct from Buenos Aires to teach us!